Sushi, sashimi, tempra, hot-pot, shabu-shabu, teppan-yaki... from simple but great homestyle to the art of culinary creation... all can be experienced in Niseko! Delicious seafood, fresh from the shores of Shakotan! Relax in our spacious restaurant and enjoy a wide variety of wonderfully fresh seafood dishes - sushi, sashimi, nabe hotpot, rice bowls or ramen. Traditional, charcoal-grilled Yakitori Mouth-watering, traditional bincho charcoal grills using delicious local Niseko produce for a great taste of Japan. Well known locally - come and join us! Beautiful views over the slopes Prime location for slope-side dining. A great buffet breakfast to set you up for a day on the slopes and a perfect spot for an energising lunch. A Fresh Seafood Journey Kick back and enjoy fresh seafood where using hands won't be frowned upon! Niseko's Premier Teppanyaki Experience The finest quality Hokkaido beef, seafoods and local vegetables, expertly prepared right in front of you. Good music, good drinks. Good times! We await you with a wide variety of sake, shochu, plum wine and a selection of tasty dishes made with organic Hokkaido vegetables. Hot oden stew for those cold winter nights! We have a wide variety of dishes from the famous oden stew to fresh sashimi and a large selection of drinks. Our friendly staff look forward to welcoming you. Lauded by critics and twice winner of Best Asian category in Australia – our much-loved chef has finally come home. A perfect venue for world-class Japanese dining and carefully selected wines and sake. A new izakaya on the block!! Sushi, nabe hotpots, snacks etc. Ramen and set meals from lunch ‘til late!! A unique and delightful collaboration with Kobito and Gochiya pub. All dishes were created in-house with exquisite care typical of a bygone Japanese era where quality counts for everything. From Shabu-Shabu to Sashimi to the only GOSETSU UDON in Japan, our dishes will stir your soul. Robata Naniwatei offers an exceptional dining experience not to be missed. Fresh crab, abalone, Wagyu and much more grilled on the Robata and served in the traditional Kaiseki multi-course style with selected Japanese sake and fine wines. Fresh,delicious sushi with an extensive wine selection A special selection of pristine ingredients, these delicious Japanese dishes is created by our Executive chef who worked for a well-known Japanese restaurant for over 10 years. Dine in a relaxed atmosphere and choose from our course menu offering Japanese dishes prepared using local Hokkaido ingredients. We also offer the rare experience of eating by a Japanese hearth. Free pick-ups from the Hirafu area. We regret inform you that our restaurant will be closed on 20 April 2019. We appreciate your support and business at our restaurant "RYOGOKU" for longtime patronage. TripAdvisors no.1 in-house dining company! Relax in the comfort of your property with the service of a sushi master, washoku or internationally trained chef. Traditional Japanese home-cooking Set in a traditional wooden schoolhouse. Home-cooked dishes made with locally grown and wild vegetables. Unique homemade wildgrass / wild grape / maple juice. Great local produce at your local izakaya! Draft beer 380 + tax! Fresh seafood direct from Shakotan. Sashimi, yakitori, chicken karage fry, grilled fish and more! Okonomiyaki & Teppanyaki from Osaka by Japanese chefs ! Fresh Seafood with the local Hokkaido cuisines at Yang Shu Ten Fresh Hokkaido produce and the oceans' bounty are turned into sushi, tempura and teppanyaki dishes including delightful local dairy desserts. HIRAFUZAKA SUNDAY LUNCH BUFFET - Every Sunday starting on 29 May 2016, Hours: 12:00-14:00, Price: 2,000 yen per guest including 1 cup of coffee or tea. No reservation is required. Walk in is welcome! Delicious food bringing out the true flavour of local ingredients. Warm and intimate, by the wood stove or watching the falling snow from the loft, let our family treat you to exquisite Hokkaido delicacies. JAPANESE HIBACHI GRILL AND FUSION DINING With over 10 years of Hong Kong 5 Star Hotel experience under his belt, Chef Kasseki's East-West fusion creations cannot be missed. Japanese green tea, sweets and liquor - We offer you the best of Japanese culture at our new cafe, bar and gift shop. Experience tasting carefully selected Japanese green teas, specialty sakes/beers and sweets. See our website for cultural events. Restaurant and Bar in a warm log house. At Wild Bill's we love the good things in life. Come and join us for a great meal before our nights really kick off after 10 pm. Japanese food, tapas style. Open everyday from 4pm. Kombu and water, infused with an abundance of veggies, meats and tofu ensure 'Nabe' is packed full of cold-weather goodness. Make-it-yourself Okonomiyaki is one of the most popular types of restaurants in Japan and a hands-down favourites amongst foreigners. Premium Sushi in a casual setting A traditional Japanese sushi counter experience. Let our experienced sushi masters prepare today's freshest ocean delicacies. Traditional Japanese Cuisine with Seasonal ingredients Regional seafood and produce, prepared to highlight its freshness and flavours. Our professional chef is adept at a wide range of dishes - Japanese, Western, Chinese and Korean and this local gathering place is packed out every day! Play pool and darts to your heart’s content. Lots of fun under one roof! Try our Donburi (Japanese fish, meat or vegetables served over rice), Gyoza (panfried dumplings), Maki roll sushi, Curry rice, salads and desserts. Extensive wine list and sake available; Happy Hour from 5pm. Drink! Eat! Chat! That’s Japanese Izakaya. Local drinks, local sashimi and a feast of locally grown vegetables. 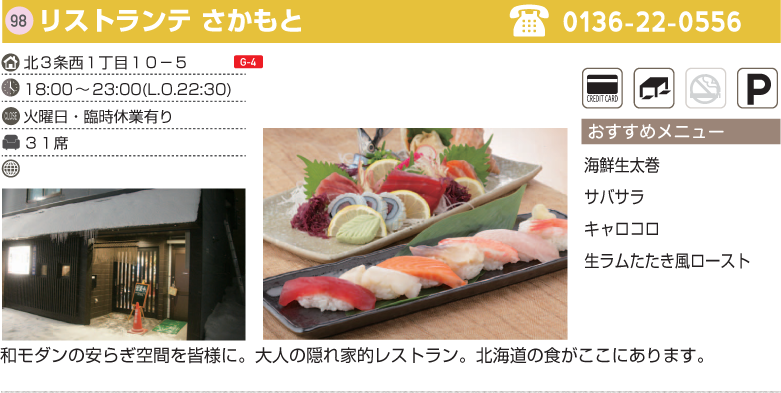 Order from the menu while you relax and drink – Japanese style!